The unrest in Kashmir raises serious questions about India’s identity as a cohesive nation. 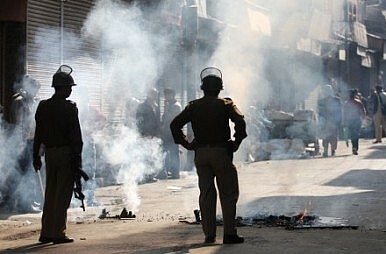 The protests in Jammu and Kashmir over the past month have raised important questions about the ‘idea’ of India. At a time when the country is getting global recognition for its democratic values, its rising economic might and for being a country of opportunity, one state is still holding out and refuses to be seen as part of this narrative. The fact that it’s doing so places a big question mark over the country’s ability to resolve its internal problems successfully. Does India lack the necessary imagination and boldness to do so? It’s a reasonable question considering the seriousness of the protests in Kashmir, protests that have come despite the presence of a democratically elected government, despite the boom in tourism in the valley, and despite significant investment by the Indian government to boost local infrastructure. More than 60 years since India secured independence, the government appears to simply accept the alienation of the Kashmiri people from the mainstream and seems to look upon the genuine political grievances of the valley as largely imported from across the border. It took more than 50 deaths during the protests for the state’s elected leadership to start trying to connect with the people and for the state chief minister to pay a visit to a hospital to see the victims of police bullets. Meanwhile, the leadership in Delhi is still just talking. Prime Minister Manmohan Singh paid a day-long visit to Leh to console the victims of the natural disaster, yet no leader from Delhi has so far gone to the valley to console families who have lost love ones shot by police. With this kind of indifference, how can we seriously think of finding a political solution? How will granting autonomy solve the problem if we don’t try to win the hearts and minds of aggrieved locals? If news reports are to be believed, the Indian government has spent hundreds of millions of dollars since the 1950s in Jammu and Kashmir, but the money has failed to impress the people. Are those faceless young people who take to the streets with stones in their hands demanding jobs or just respect from their government. From what I’ve seen when covering the conflict area in the North-east of the country, rather than trying to solve the problem, the government is trying to tire the movement out. Despite being in talks with the Naga rebels since 1997, the government has failed to come up with any solution to the six-decade-old insurgency movement—it just seems to be stalling for time by holding countless rounds of talks without offering anything concrete. And this is what the central leadership has been doing in Kashmir for decades. Every time there’s a problem, it offers to dole out some autonomy and political engagement, but forgets its commitments the moment the protests peter out. The world often seems enamoured with our country, but our people are losing faith in the Indian political leadership’s ability to assimilate the disparate ethnic and political voices in its narrative for the country.